Image on the left and other images all over this website and forums represents what many users in the private chat rooms were able to see via screen sharing in real-time as the trades occurred in the broker trade execution platform by the user name wrbtrader (former user name NihabaAshi)...real name M.A Perry. 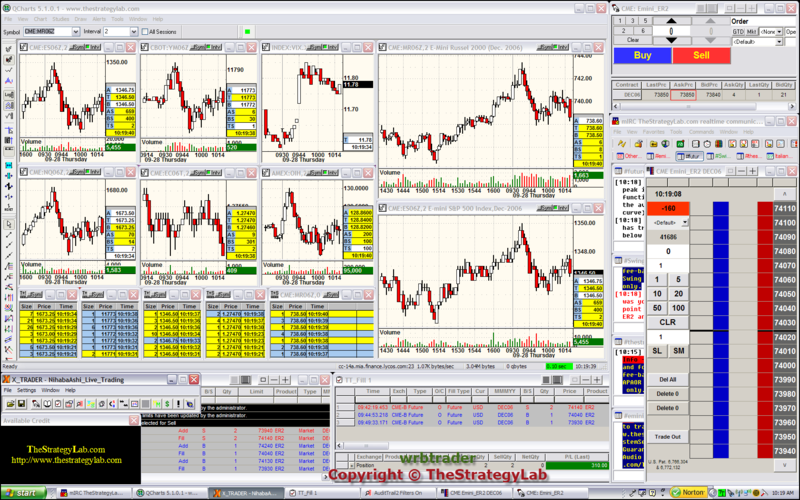 I took a quick screenshot during the screen sharing for marketing purposes, for my own private trade journal documentation (other two monitors not shown for security reasons) and for verification that I traded on that specific trading day I posted trades in my broker trade execution platform in front of an audience as shown above in the image and then the same trades are posted in the free chat room in front of an audience with an average of 3.2 seconds delay via an auto script. These broker PnL statements are for those that were not in the chat room or not allowed in the screen sharing for whatever reason with others that were allowed so that they will know I did trade on that particular trading day. Screen sharing is a two way street involving TheStrategyLab (M.A. Perry - wrbtrader)...never one way. Thus, it's only done with members that allow me to see them place trades in their broker trade execution platform and then they must post the same trades in the free chat room...just as they were allowed to see of my trading during the screen share. To be precise, all members can see each other's screen during screen sharing. Copying (mimic) of trades of any member is strictly not allowed in the screen sharing or free chat room here at TheStrategyLab because its not a signal calling alert service and I'm not interested in such a service...never have. Mentoring is not allowed because I do not offer a mentoring service...never have. Recordings by a member during the screen share is only allowed if every member in the screen share agrees to such. This policy we have here at TheStrategyLab helps to minimize the trolling by lazy traders and scam review websites. My name is M.A. Perry (a.k.a. online as wrbtrader) and the performance record shown at the above link represents my trades only regardless if you call it a track record, trade history, trade journal or performance record...different names but the same data. Trades of M.A. Perry (wrbtrader) represents trades of TheStrategyLab. All trades were posted in real-time on the IRC Freenode server along with users of WRB Analysis that posted real-time trades in the chat room called ##TheStrategyLab (former location of chat room on IRC Othernet server). ##TheStrategyLab chat room has had many names over the 15 years existence due to the types of members using the chat room. Yet, in the past, many users in the chat room were using their own trade methods whereas only about 20% of the members of the chat room were using WRB Analysis. Today, about 80% of the users are using WRB Analysis although the remainder members understand basic concepts about WRBs, WRB Hidden GAPs, volatility contraction, reaction highs/lows, WRB Zone, S/R areas of WRB Zones & WRB Hidden GAP intervals. That basic understanding by those traders not using WRB Analysis...it allows them to understand the commentary in the chat room by those using WRB Analysis. If you do not believe the performance (broker statements or real time trades) by users of TheStrategyLab or you do not believe wrbtrader's performance (broker statements & real time trades) or you didn't qualified for the screen sharing with members of TheStrategyLab...you can test & review the WRB Analysis free study guide or test & review the free Fading Volatility Breakout (FVB) trade signal strategy at the below links. Note: The FVB trade signal strategy is not the only trade signal strategy the TheStrategyLab uses. Yet, it will give you a good indication about how we communicate & explain our trade methods...you can then backtest it, post your broker statements (simulator) and quantitive statistical analysis of your trading via WRB Analysis prior to you purchasing our trade methods. Once again, wrbtrader's performance record is stored at the free TSL Support Forum for security reasons and the archive chat logs of the chat room are stored at the FTCHAT Support Forum. In addition, the daily broker statements for wrbtrader are stored at the free TSL Support Forum whereas users of TheStrategyLab have their own private threads to store their broker statements and quantitative statistical analysis...their threads are private for security reasons. Today, each user of WRB Analysis now has his/her own private threads to store their brokerage statements, quantitative statistical analysis, DOKs and trading related questions to prevent identity theft, impersonations, hack attempts and other types of fraud. Simply, this is private information. All the trades shown in the performance record are via the analysis called WRB Analysis and the trade signal strategies called the Volatility Trading Report (VTR). The trade signal strategies are dependent upon the WRB Analysis.